Gravity, we would do without it. What you see in the picture is not one but two galaxies that are “crashing” gravitationally speaking, the large bottom and a dwarf, up. Obviously, gravitationally, by mass, which is winning it is lower and therefore the top you can see the hydrogen is escaping from the stars and dust the top has or had. 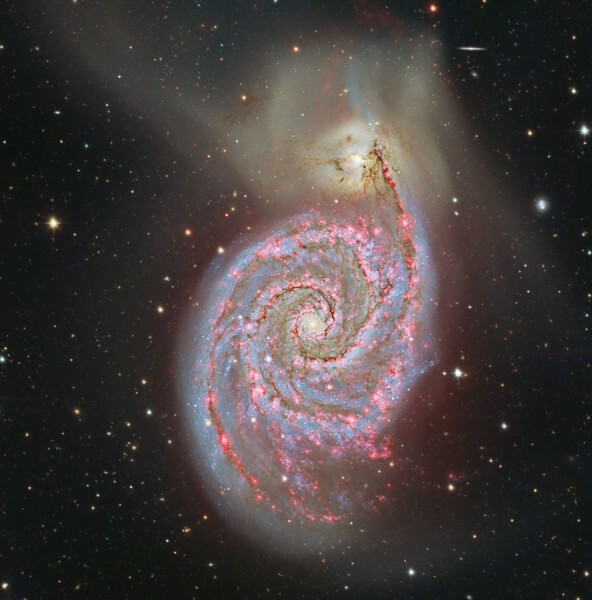 The lower is the NGC 5195 and the top is called the M51. The interesting thing is not to think about the destruction of galaxies, but in the small, one can see areas of high gravity mass due to both the gravity pulling down the small and the pushing up of the big. Are very dark areas certainly are forming new stars. So the shock is not only destruction and separation, it is also life, new life of stars.